Sustainable Market Farming: Intensive Vegetable Production on a Few Acres by Pam Dawling answers most of the questions I’ve heard from aspiring market gardeners and even some established market gardeners. 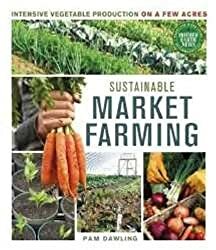 Whether you are hoping to sell at the farmer’s market, start a CSA, or just get a better handle on your own kitchen garden, this 400+ page book provides practical market farming answers. I especially like the individual chapters on growing specific vegetables. For example, there is a 15-page chapter on growing tomatoes and a 10-page chapter on growing potatoes. The shortest chapter on individual vegetables is five pages, which still contains a lot of information about growing a single vegetable, and this is not something I have ever seen in another book! The book also includes excellent photos and practical charts and graphs. For example, Pam’s lettuce log from 2012 provides a real-life example so you can see how the days to transplant decreases as the weather warms up and then increases again as the weather cools down in fall. She could have just written that sentence in her book, but by providing an actual record from her garden, we are able to really understand how it transpires. Pam’s 38 years of gardening experience truly shines through the pages of her book, and whether you are a complete novice or a seasons pro, you’ll find lots of practical information in here. I definitely give it two thumbs up, and I’ll be reading over it again this winter when preparing for next year’s garden. I received a free copy of this book from the publisher in exchange for an honest review. This blog post contains affiliate links. I'm in my first year market farming on my own and have learned a ton–but tons more to learn! This book seems like one that I would refer to over and over. Thanks for hosting the giveaway! I would love a copy of this book.mI won't be selling vegetables but it looks like such a good resource to have for a home garden. It is! I should have mentioned that in my review! It's been several years now since I've had a "real" garden – meaning one that is well-rounded and productive. Surely there will be much good information for me – just in the review were some tidbits.